April 22, 2016. We are sad to report that Shaman has left us to join her long time skipper Stan, who passed away in 2009. 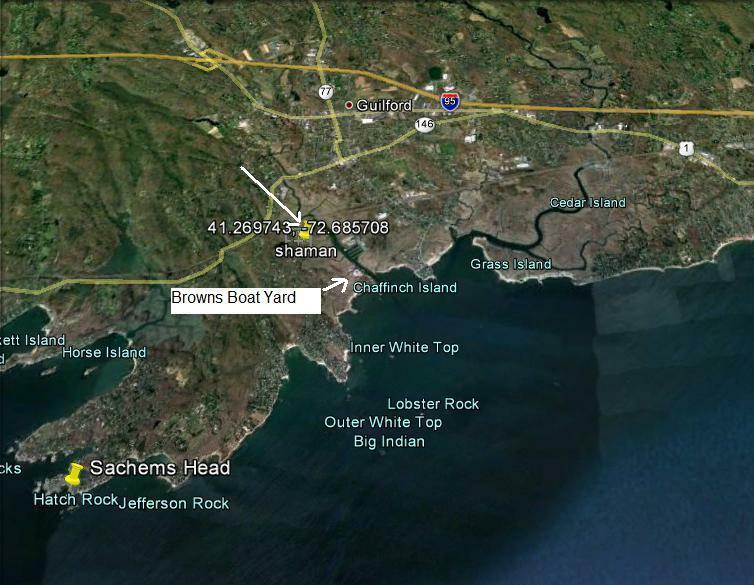 Shaman's story of having been washed off her poppits in Brown's Boatyard during Hurricane Sandy in late October, 2012 is reported at the bottom of this page. Your webmaster, on a 'routine' driveby inspection yesterday of Shaman's last known resting place in the marshes in Guilford, noted what looked like fairly fresh 'cat tracks' though the tall grasses. This prompted a stop and short walk toward her last known resting place. She was gone. 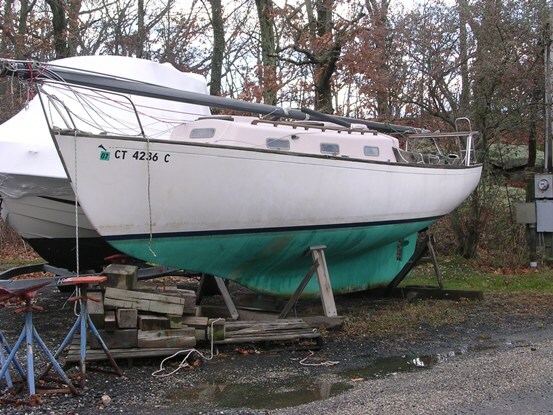 A couple of photos (see below) were taken to memorialize her absence, then a couple of phone calls were made to the local boatyard, and the Connecticut State DEP that contracted her removal along with 3 other boats simularly stranded. This resulted in a conversation with the contracting company that operated a 'Marshmaster' that got her out. They advised that she had been cut up. Interestingly, the manager of the company located in the next town, Madison, lived in Guilford and knew of Stan Barnes, a popular forrmer 1st Selectman in town. He made a local effort to find someone willing to take her, but he was unsuccessful. Shaman was bought from Orienta Marine in Mamaroneck, NY on November 13, 1960 for $6400.90. (Stan has his old check stub for a check for $5400.90 - a $1000 deposit had been previously made. Along with other tidbits of information this lends credibility to Marscot/O'Day having built perhaps as many as 30 Dolphins in 1960). 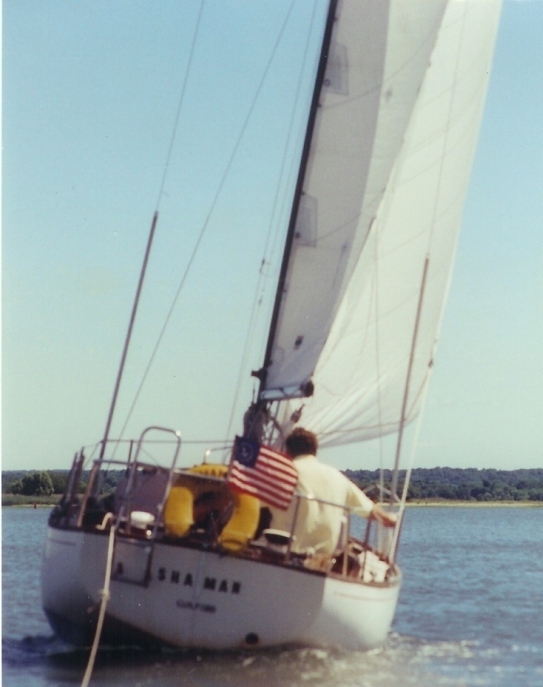 This included a Palmer 8 hp, fuel tank, companionway ladder, dacron main (with sail #25) and jib, mast, boom and rigging, running rigging for the main and jib and 2 manila dock lines. There was nothing below except the cabin floor, the mast bulkhead and midship bulkhead. The interior was my fall and spring project - double bunk forward, 2 quarterberths, a bronze centerboard and an aluminum rudder. 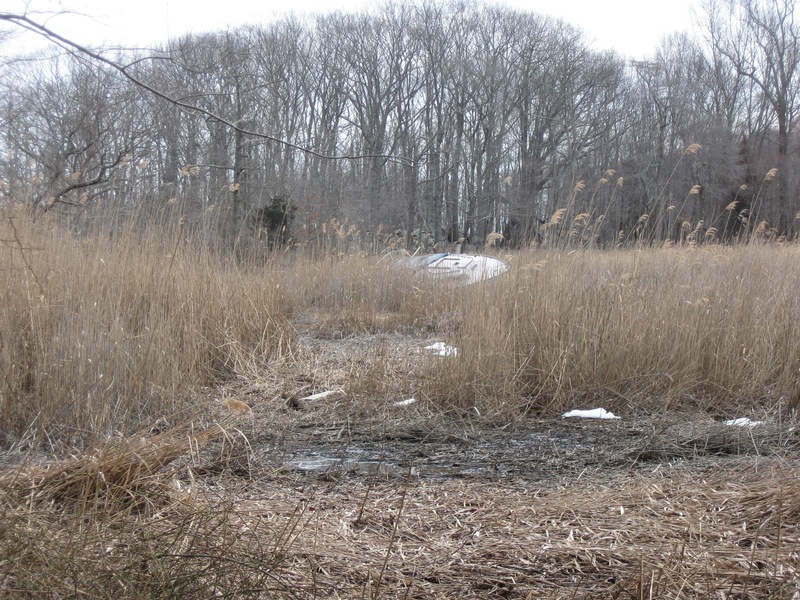 In thinking back, the cradle and hull were delivered to the field next to the house here (Guilford, CT) and though the money went through Orienta, I believe the trailer brought it from Fall River or New Bedford. I had to arrange a rig to unload the trailer. We kept the cradle and used it many years. In short, I am certain that Shaman was not a Lunn product, although its tempting to think it possible. We were a year later than (Stan ) Secura and his # 7 (JATO) He impressed us with appearance and performance in the O/S (Off Soundings) race of '59. (see below) She was a sloop version of Trina. I also built a backstay mizzen which worked for cruising - ever see one? It's in my attic loft. (Alexandria has it now!) Anything else? 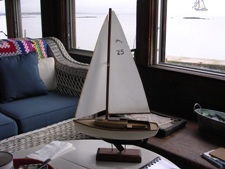 I have a 12" model on my shelf - full sails and interior. Come and see it some time this Fall. Give me a call when summer is over - we can have a talk! Webmaster Note: Stan and Shaman had an outstanding race record. In 1965 They won the Off Soundings Charles Koch Trophy for the top Class B boat in the combined four races, Spring and Fall regattas - about 50 boats competed in this Class. 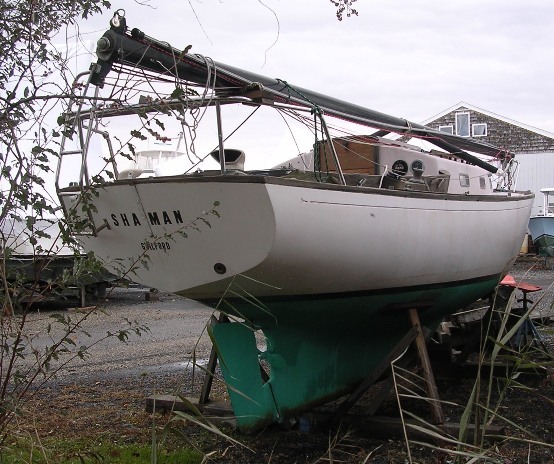 Stan sold Shaman a few years ago and she currently sits at Brown's Boat Yard in Guilford, CT. More on her is coming. Stan Secora (JATO, Marscot/O'Day #7) says he picked up his boat on May 11, 1960 and a review of the Off Soundings Club race records indicate that Stan Secora did not race in Off Soundings that year. Maybe Stan Barnes really means some other local club race in 1960, not 1959? Lunn Laminates built 25 Dolphins starting sometime in early 1961. Ralph Heinzerling (Jack Rabbit) has an interesting story about how he bought his bought his boat at the 1961 boat show. It involves Lunn Laminates and indicates that Lunn started building Dolphins early in 1961 (click here to go to Jack Rabbit) One story about the hull number issue is that Lunn was instructed by O'Day to start their series of 25 boats with hull # 200. We are continuing to dig deeper into this. One might wonder why this all matters. A quick look at the Roster by hull # shows a bunch of missing numbers in the early/mid 60's. O'Day was subcontracting out to others some of the construction of Dolphins - at least 2 other builders, besides Lunn. We are trying to find out how many boats were actually built, and by who, before O'Day got out of the Dolphin business and Yankee Yachts started in 1965. The hull # game is elusive but gradually may help us find out what we want to know. For more on this click here. 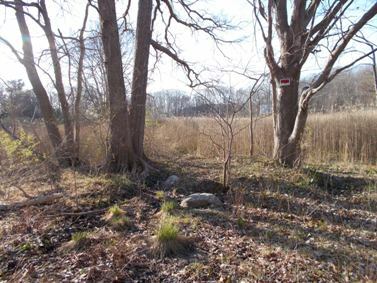 While we had spoken by phone many times previously, your Webmaster met Stan Barnes for the first time on December 3, 2007 at his house at Tuttle Point in Guilford - a spectacular spot on the water with a great view of Faulkner's Island, Long Island Sound and the rocky Guilford shore. Among other things he showed me was the model he carved of Shamon which appears at the left. Click here for a larger view. The cabin top comes off so you can see the interior. Shamon's mooring was right outside the window. between that small islet and the shore. Note the sail in the distance. Shamon's new owner, Mike Barber, with whom who we have not yet had contact, keeps her at nearby Brown's Boat Yard where Stan had her too. Your webmaster snapped the following pictures. July 2, 2009 - Stan Barnes passed away on June 24. He was 88. Stan was one of the very early, and important contributors to this website. He loved his Shamon and his spectacular views of Long Island Sound and Faulkner's Island from his home on Tuttle Point in Guilford, CT. I have been to his house several times for Dolphin history lessons, and once I took him to the Guilford Library to spend some time going over the website with me. A former selectman, teacher and principal in town, we had a hard time actually getting into the building as several people stopped us and wanted to chat with him. He will be missed. February 23, 2013. We got word that Shamon floated off her stands during "Hurricane Sandy" and ended up in a marsh. Efforts to sledge her out are being contemplated/organized. DFI staff working on getting more of this story. Tom Russell sent in a couple of emails - they have been consolidated and edited. Just wanted to say GREAT job with your website! I am Tom Russell in Guilford Connecticut, who has stumbled across a Dolphin in a marsh washed up by Sandy. Now have keen interest in boat data. 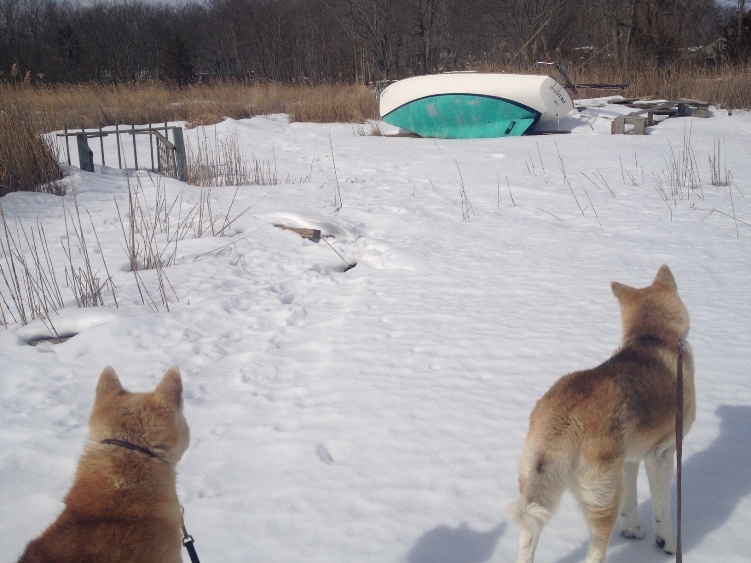 They are such lovely boats, and I want to rescue her before the snow melts. We are going to make a sled and get her back up on her feet this year. Wish us well. Stan Barnes boat "Shaman". He was a local well known character in town...You have to see the path Shaman took. It was as if Stan was at the helm, threading her into a marsh that was turned into a cove with all the high water.Biff Cuthbart, in whose marsh she lays, told me today...that "at the early hours of Tuesday when the moon came out, he saw a boat floating westward through the trees...I had to rub my eyes to see if I was imagining things..." Seems like not a scratch on her. Laying asleep on her starboard ear. 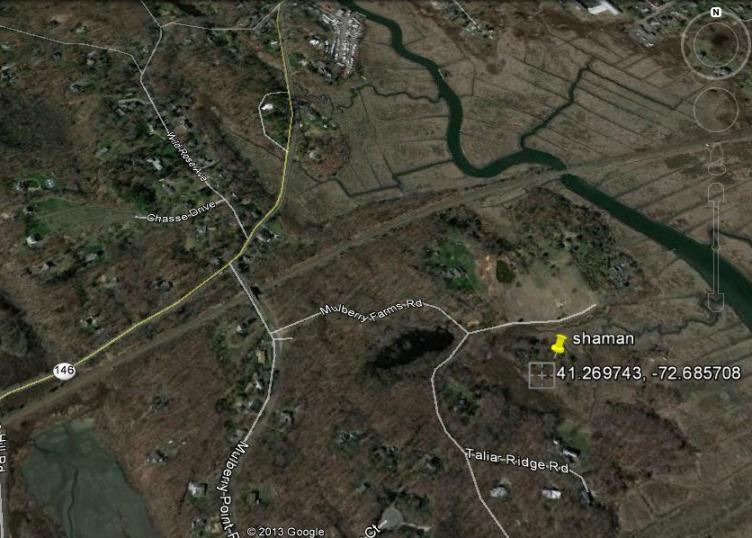 Here is a Google Earth map of her current location. 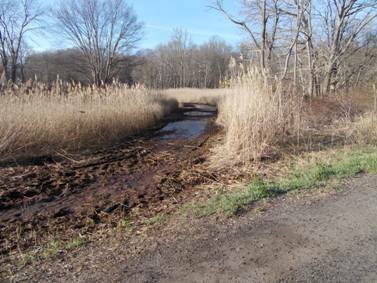 I believe "Shaman" is still salvageable; the task all along has been to remove it from the salt marsh with out causing damage to the marsh, or "Shaman". There is a clear path from a previous removal of an Edgewater 24' that is still the best way out. I'll give you a better estimate of its current status soon. There are some parts to be delivered by the owner as agreed to on a prior inspection - mast? Sails etc. July 17, 2018. Shamon's sails are FOR SALE. Click Here to go to that page.